Turn Debt Around on Facebook! Did you know that we have a Facebook page? In fact, we’ve had it for a while, although it’s been hibernating for some time while we’ve been reviewing our marketing strategy. After such a long sleep, and no regular activity, our page is still quite low on ‘Likes’, but we’re working on that. If you are on Facebook, why not have a look at our page and click the ‘Like’ button under the cover / banner image, on the right-hand side of the page, to receive our updates and news? We’d love to interact with you on Facebook, so feel free to say hi or post any questions, comments, private messages or even photos and videos, and we’ll get back to you. 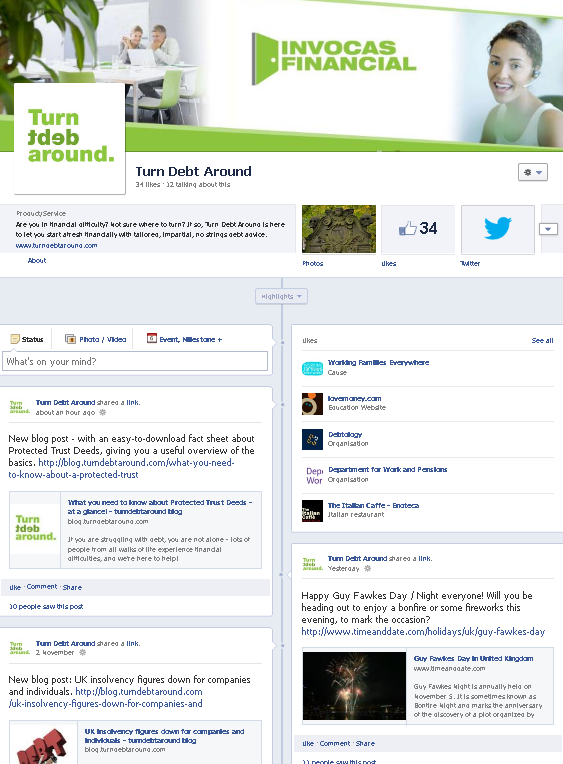 Have a look at our Turn Debt Around Facebook page now – we look forward to seeing you there! This entry was posted in Uncategorized and tagged Facebook, social media, turndebtaround by Invocas. Bookmark the permalink.